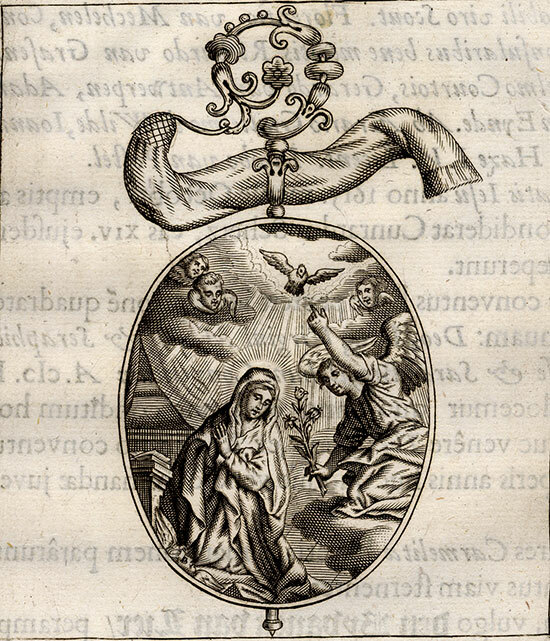 Subject: Plate : This plate shows a religious emblem with Mary of Nazareth and angels. Condition: Excellent given it's age. General age related toning and light staining. Paper edges a bit irregular with very small tears. Please study scan. Medium: Copperplate engraving on verge type hand laid paper with watermark. Size (in cm): The overall size is ca. 23.5 x 36 cm. The image size is ca. 9 x 10.5 cm. Size (in inch): The overall size is ca. 9.3 x 14.2 inch. The image size is ca. 3.5 x 4.1 inch. Description: This plate originates from: 'Notitia Marchionatus Sacri Romani Imperii, Hoc est Urbis et Agri Antverpiensis, Oppidorum, Dominiorum, Monasteriorum, Castellorumque sub eo. (...).' , by J. Le Roy, published by F. Lamminga, Amsterdam 1678. This is a chorographical description of the Margraviate of Antwerp, divided in 10 counties: Antwerp, Ryen, Zandhoven, Herentals, Geel, Hoogstraten, Turnhout and Breda. The plates were later used in other works by this author as well. Jacques Le Roy did extensive archival research, but he is reknown for his iconography for which he employed talented artists like Jacob Van Werden, Frans Ertinger, Wenzel Hollar, Lucas Vorsterman II and others. The engravers in this work include: Henricus Causé (1648-1699), Franz Ertinger (1640-1710), J.Harrewijn, Robert Whitehand, Bouttats, N.Stramot, G. De Bruyn. The imagery is highly reliable. His works were translated in several languages. 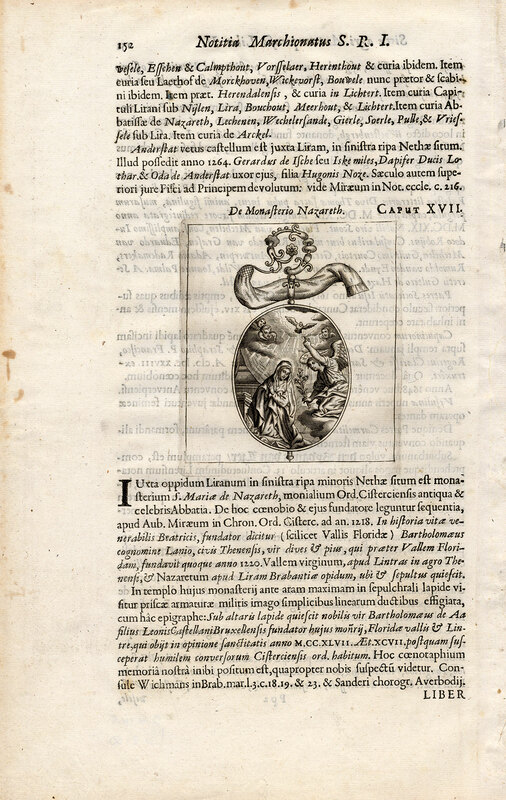 Artists and Engravers: Author: Jacques Le Roy, also referred to as Jacob or Jacobus, was a Flemish baron, historian and theologian who lived from 1633-1719.